It is with profound sadness that we announce the passing of Masud Abdullah Tariq-Towe. He was the former host of Gardens of Tranquility and Contemplation on Saturday mornings from 8am-11am for 15 years starting in the summer of 1990. In the spirit of each one teach one, he mentored the late Daai’ya Sanusi to take over the program in 2005. When you tuned into Masud’s show, you were treated to artists who epitomized the heartbeat of Jazz like Miles Davis and John Coltrane. But it was his humble, peaceful delivery of Sufi readings that set his show apart from others. His readings gently prodded you to wake up and contemplate life and love. Masud was also a world traveler, scholar and veteran of both the United States Army and Navy. He taught U.S. History, Social Studies, and Music at Alfred E. Smith High School, and later at Harry S. Truman High School both in the Bronx. He was an Imam at Masjid Al-Farah, in addition to serving on the Spiritual advisory committee for Cordoba House, a community he belonged to for over 30 years. 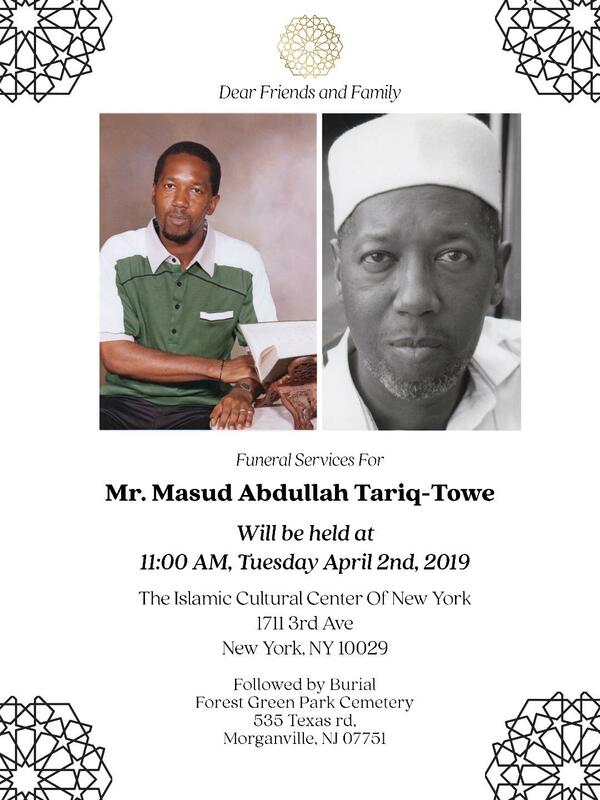 A homegoing service was held for Masud on Tuesday, April 2nd at 11am at First Ave Funeral Service, 349 East 116th St, between 1st & 2nd Ave in Harlem. Masud’s family asks that those who wish to support go to www.gofundme.com and search for Tariq-Towe, that’s T-a-r-i-q dash t-o-w-e.
Cards, checks and money orders can be sent to the Tariq-Towe family at 112 West 138th St. Apt 2F, New York NY 10030. Masud Abdullah Tariq-Towe, a true Harlem legend.